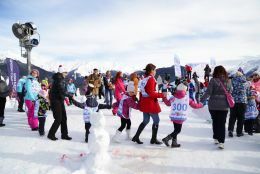 World Snow Day celebration took place at Rosa Khutor resort on January 17. The host of the event was Kolya Serga (Orel and Reshka TV show) on barter basis. The main participants of the event were children, for which a comprehensive entertainment and educational program was developed. At Plateau 1170 m above sea level a snow town was built. 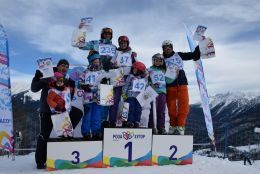 Various contests and master classes, prepared by Rosa Khutor partners and employees were part of the program. In the time from 11.00 till 14.00 free skiing classes for 33 kids in the age of 5-12 were conducted. A “Young sculptor” contest was held (snow modelling) – with ten teams, consisting of 1-2 families. The experts to select the most original and beautiful snowmen were the team of the event’s organizers. 2 winning teams were selected and additional third nomination “the most family-oriented snowman” was implemented. Winning teams received diplomas “Winner of Young sculptor contest -2016”, brand awards “Rosa Khutor” – T-shirts, thermomugs, stickers sets, pens, magnets and ski-pass certificates. All contest participants have been awarded “Rosa Khutor” souvenirs and diplomas for participation. In “Snow battle” game 2 teams of 25 children each have participated. The game consisted of several stages – preparation of snow battle shells, cross-fights, direct attack, offensive and assault of mountain fortress with taking hold of the Flag. All participants have received sets of souvenir products and BIC kits. 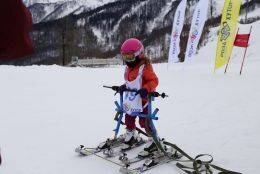 Family amateur contests in mountain skiing and snowboarding “Snow Order-2016” have gathered 20 pairs of participants (pair consisted of a kid and a grown-up). The team Anastasia Kuznetsova, Kristina Vedykalo has taken 1st place (42; 44 sec), Andrey Shilov, Lera Kostyuchenko (47; 64 sec) – 2nd place, Kirill Vedykalo, Maxim Vedykalo – 3rd place (48; 54 sec). Prize “for Will to Win” was awarded to the team of Andrey Batalov and Tatyana Batalova. Prizewinners have received certificates for ski-passes, certificates from “Mandarin jam” and Rosa Khutor brand souvenirs. All the participants of the competition have received diplomas, Rosa Khutor souvenir products. A birthday boy was detected at the event – a disabled boy, with a passion for skiing sports. On January 17th he became 10 years old – he was congratulated and awarded a ski-pass for 3 days of skiing, as well as Rosa Khutor brand set. During Snow Day various games and contests were conducted, in which the kids have also received memorable prizes from the resort and BIC company. Musical and dancing accompaniment was performed by cover band “Kurortny prospect”. Absolutely all young guests of the World Snow Day at Rosa Khutor have been charged with excellent snow mood and received memorable gifts with Rosa Khutor branding. Partner “Mandarin Jam” cafe – three gift certificates for 1 000 rubles, 1 000 rubes, 1 500 rubles. Gift certificate for 40% discount. Lunch for employees, participating in the event organization (10 people). Partner «RusSkiClub» - photo-shoot of the event..
BIC company – prizes for the event participants.